Cuadro historico-geroglifico, las tribus Aztecas II. Cuadro historico-geroglifico, las tribus Aztecas I.
Carte De La Vallee De Mexico. 1 mapa. A la part inferior: Tom. XII, Num. 10. Profile du Canal de Huehuetoca. Map Of The Valley Of Mexico and the Surrounding Mountains. Partie du Mexique. Amer. Sep. 65. The coast of Mexico from Laguna de Esmotes to Punta Brava. 214. Mexico, Central. The World Atlas. 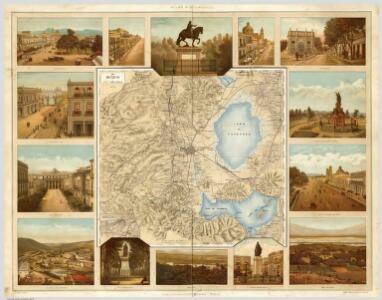 Carte de Fausses Positions de Mexico, Acapulco, Veracruz et du Pic d'Orizaba. A Correct Map Of The Seat Of War In Mexico. Anahuac, or the Empire of Mexico, the Kingdoms of Acolhuacan & Michuacan. Sketch of the ... Internal Provinces of New Spain. New Map of North America.